A scanned electron micrograph of a device used in this experiment. Thin sheets of graphene and hexagonal Boron Nitride are stacked and shaped by electron beam lithography to create this device. The purple layer is the bilayer graphene sheet. 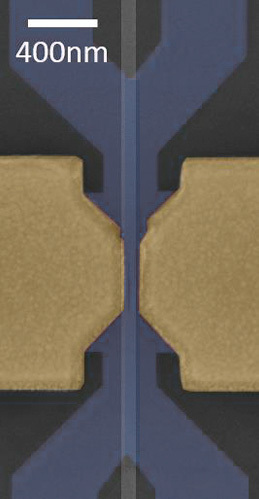 The bottom pair of split gates (dark squares) are made of multi-layer graphene. The top pair of split gates (gold bars) are made of gold. The one-dimensional wires live in the gap created by the split gates. Think of electrons as cars and the valley states as blue and red colors, Zhu suggested, just as a way to differentiate them. Inside a sheet of bilayer graphene, electrons will normally occupy both red and blue valley states and travel in all directions. The device her Ph.D. student, Jing Li, has been working on can make the red cars go in one direction and the blue cars in the opposite direction. “The system that Jing created puts a pair of gates above and below a bilayer graphene sheet. Then he adds an electric field perpendicular to the plane,” Zhu said. “By applying a positive voltage on one side and a negative voltage on the other, a bandgap opens in bilayer graphene, which it doesn’t normally have. In the middle, between the two sides, we leave a physical gap of about 70 nanometers,” Li explained. Inside this gap lives one-dimensional metallic states, or wires, that are color-coded freeways for electrons. The red cars travel in one direction and the blue cars travel in the opposite direction. In theory, colored electrons could travel unhindered along the wires for a long distance with very little resistance. Smaller resistance means power consumption is lower in electronic devices and less heat is generated. Both power consumption and thermal management are challenges in current miniaturized devices. Li worked closely with the technical staff of Penn State’s nanofabrication facility to turn the theoretical framework into a working device. "The alignment of the top and bottom gates was crucial and not a trivial challenge. The state of the art electron beam lithography capabilities at the Penn State Nanofabrication Laboratory allowed Jing to create this novel device with nanoscale features," says Chad Eichfeld, Nanolithography Engineer. Their paper, titled “Gate-controlled topological conducting channels in bilayer graphene,” appears online today, August 29, in the journal Nature Nanotechnology. Additional authors include Ke Wang and Yafei Ren and their advisor Zenhua Qiao of University of Science and Technology of China, who performed numerical studies to model the behavior of the wires. The high-quality hexagonal Boron Nitride crystals used in the experiment came from Kenji Watanabe and Takashi Taniguchi of National Institute for Material Science, Japan. Two undergraduate students, Kenton McFaul and Zachary Zern, contributed to the research. Funding was provided by the U.S. Office of Naval Research, the National Science Foundation and funding agencies in China and Japan. Kenton McFaul, a visiting student from Grove City College, was supported by a Research Experience for Undergraduates grant from the NSF NNIN. Jun Zhu is a member of the Center for 2-Dimensional and Layered Materials in Penn State’s Materials Research Institute.